Arbroath Abbey was founded in 1178 by King William the Lion and dedicated to Thomas Becket. 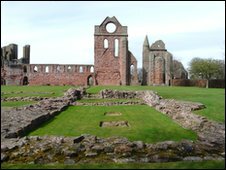 The abbey was established by Tironensian monks from Kelso Abbey who were invited by King William to establish a religious base in Arbroath. 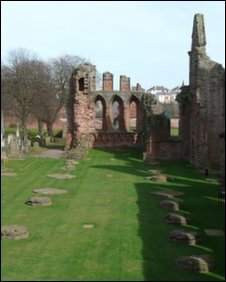 The monks remained at the abbey until the Scottish Reformation in 1560. After this time parts of the abbey were dismantled and removed for use in building a new church. 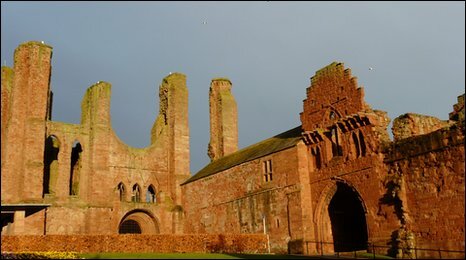 The red sandstone that was used in building the abbey came from local sources including the cliffs of Arbroath. Cart tracks that can still be seen rutted into the cliffs are rumoured to have been done by the monks at the time of the abbey's construction. Much of the abbey is now in ruins but the abbot's house and gatehouse remain intact. The most striking building that remains today is the ruins of the 'Round O', a large circular window that dominates the landscape. This window, when lit, was used to guide shipping. The Abbey is most famous for the Declaration of Arbroath of 1320 in which the independence of Scotland was asserted. The Declaration was a letter to Pope John XXII, marked by the seals of Scottish nobles, appealing against England's claims on Scotland. An annual historical pageant takes place at the abbey re-enacting events from that time. The abbey gained worldwide media attention in 1951 after The Stone of Destiny, which had been stolen from Westminster Abbey on Christmas Day 1950, was left in front of the altar, close to the tomb of King William the Lion. A letter 'to enable the Stone of Destiny to be safely restored to the Scottish people' was taken to the local police station. The theft of the stone was undertaken by a small group of Scottish nationalists, led by law student Ian Hamilton. The stone had been used for the coronation of Scottish Kings until Edward I of England, 'the Hammer of the Scots', had captured it and placed it in Westminster Abbey where it remained until the theft in 1950. The thieves were not prosecuted and Ian Hamilton went on to lead a successful career as a criminal lawyer. The stone was officially returned to Scotland in 1996 and now resides in Edinburgh Castle. It will be used in future coronations at Westminster Abbey. 1178 - Arbroath Abbey founded by King William the Lion of Scotland. 1272 - A storm hit the abbey leading to the bells partially melting. In the same year famine hit the country. 1320 - The Declaration of Arbroath was written. 1350 - The abbey faced assaults from English sea-raiders. 1380 - A great fire known as 'The Devil's Fire' damaged the abbey. 1446 - A battle for the right to be the judge of the abbey's court was fought outside the abbey gates between those loyal to the Ogilvy and Crawford families. Six hundred were killed in the battle. 1561 - The abbey falls into decline after The Reformation of 1560. 1815 - The first steps to preserve the abbey are taken with an application for funding to the exchequer. 1924 - Proper steps are taken to preserve the abbey as the state takes ownership. 2008 - The public campaign begins to have the abbey recognised as a World Heritage site.